In the past few weeks I have been looking through the recipes I gathered through the first winter as a newlywed here in France in my first Kitchen Notebook. There are some real oldies but goodies that we go back to every year. 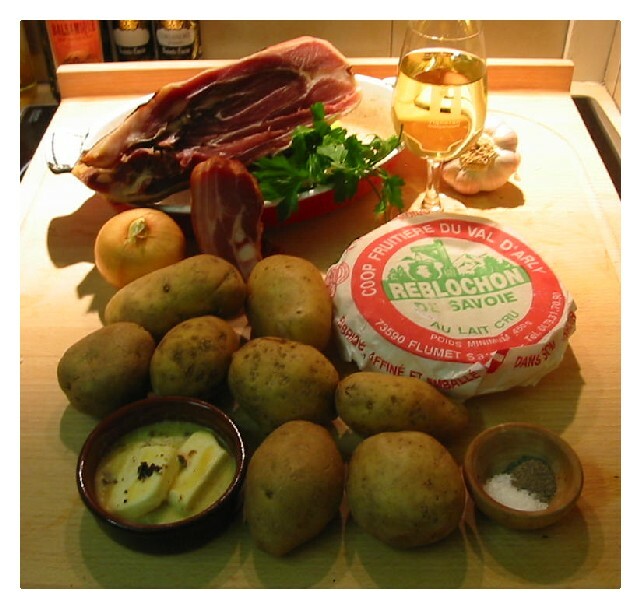 Recipe number 18 is one such recipe, an absolutely delicious potato dish that uses a specific cheese from the Savoie region, the Reblochon. At the ski and hiking station towns in the Alps, especially when there’s a snow problem like we have this year, you'll find would-be skiers wandering through the ski stations looking for something to do. This year is bound to be a banner year for the local cheese co-op. We made a cheese pilgrammage to the town of Thones which has a Reblochon creamery, with more description of the co-op there. The ski town co-ops are usually found in the heart of the ski station or not far from it, and is the place where local farmers with troops of the right kinds of cows (Abondance, Tarine and Montbéliarde in the case of Reblochon) that have eaten the right kinds of things throughout the year bring their milk. Creamery produced Reblochon de Savoie produced on site is the Cooperative cheese you can find in these local shops. You can identify the creamery made cheese by the little red label on the cheese. Reblochon de Savoie which has been produced directly on the farm from only one herd is marked with a green label. It is produced in much smaller lots, and can be more expensive. One of the main differences with this cheese is that the milk, being direct from the milking, is warm from the cow when the natural rennet is added. Most farms which are certified to produce Reblochon cheese from their single herd’s milk do it directly from their twice daily milkings, thus produce two small lots per day. With creamery produced cheese, the milk that comes in from local farms is put together once daily and brought up to cow body temperature before they add the rennet, although like the farm produced cheese, it is not pasturized. Some farmers take some of their milk for farm production of Reblochon, and send the leftover to the co-op. Under both conditions, the milk comes from specially raised and fed cows with living conditions that are specified under the AOC. Like most traditionally produced cheeses, the flavor of Reblochon cheese varies throughout the year. The cows for Reblochon producing herds eat herbs and grass in the open air throughout the warm months, and have a specially AOC controlled diet in the barn during winter. The differences in flavor really depend various subtle differences in method between the cheese makers, located within strict geographical boundaries, but most of all the conditions during affinage. Your local fromagère can have a lot to do with how the taste develops. Choosing farm-produced Reblochon will not necessarily give you a better flavor, but it may taste a bit different from the co-op cheese in the same town. The conditions for production are strict enough and so similar that both farm and creamery produced Reblochon have the same wonderful rich creamy tangy flavor redolent with the pastoral goodness we find so typical in this cheese, and the differences are sometimes not discernable. We never hesitate to stop at the co-op and buy lots of creamery Reblochon, because co-op produced cheese is still excellent, not to mention the price – about half of what it costs from the fromager in the city. We serve Tartiflette in winter, with a salad and crusty French bread. This is truly a one dish meal, and it’s very easy to prepare. 200 grams (6 ounces) of smoke and salt cured pork in any combination: poitrine fumé or the best smoked bacon you can find, smoked bacon plus salt cured Savoie ham or Southern style country cured ham. Just get what’s the best cured pork available to you. - Peel the potatoes and cut them into slices. - Roughly chop the onion. - Heat the duck fat in a heavy skillet and add the onions, bacon and ham, and sauté gently for 3-5 minutes. - Add the potatoes and continue to sauté for 5 more minutes. - Add the wine, give the potatoes a stir, cover, season with salt and pepper as desired, and let simmer and steam in the wine for 10 minutes more. - Grease the gratin pan with duck fat, crush the garlic clove, and rub the garlic clove all over the inner surface of the pan. - Reserve the remaining garlic for another use (the vinaigrette for the accompanying salad, for example). 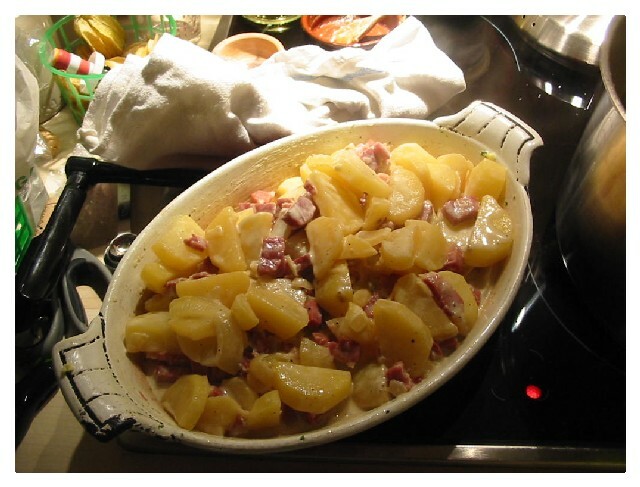 - Add the crème fraiche to the potato onion bacon mixure, and transfer it to the gratin pan. 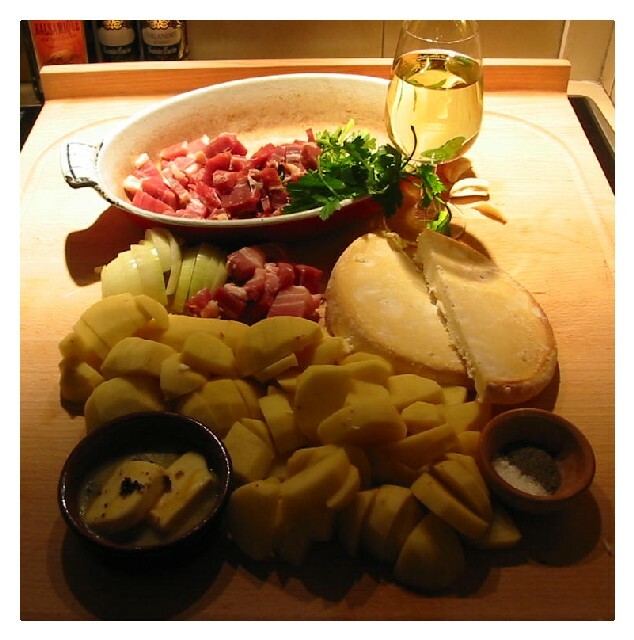 - Slice the Reblochon in half with a sharp knife flat wise, and place the two pieces on top of the potatoes, rind side up. - Turn off the oven, and leave the dish in the oven without opening it for another 10 minutes. - Serve hot with a salad, crusty bread, and the the wine you cooked with. I love all potatoes!! !This looks sooo very good. Great way to show the progression of this dish! Lucy's photographs do that very well, don't they, Tanna? They show a real French kitchen, too, and I am always both drooling and envious when I visit here. This looks good, Lucy — and relatively easy, Thank you! Looks lovely, Lucy. Coincidentally I had tartiflette for my dinner last night with a green salad. It's perfect dish for this time of year. I'm such a fan of one pot meals...makes life so easy! Lucy, it's so nice that you return to these old recipes and share the experience with us. I remember tartiflette from your first egullet blog; it looked good then, and it looks good now! 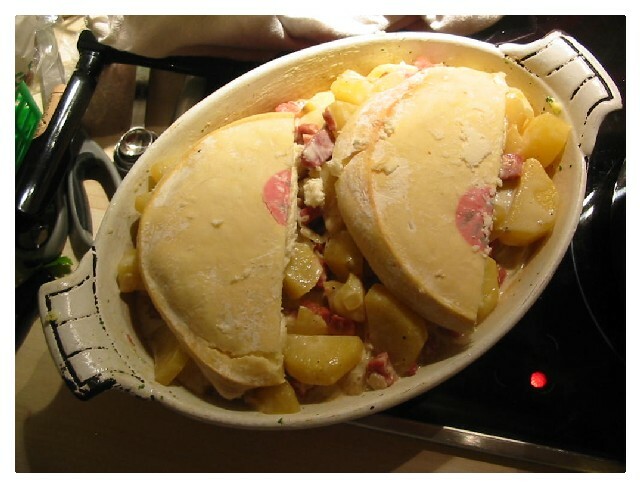 Lucy this was the first recipe of yours that I tried as I love tartiflette but hadn't found the right recipe. Glad that you are still enjoying it too- the roblochon is getting harder and harder to find here in the states. That is very sad to me! an excellent post and very imformative-always enjoy stopping by! Mmm...tartiflette. I think we'll eat our fair share by the end of winter! Whole Foods says it can't import reblochon because it's soft raw cheese, as opposed to aged raw cheese. Had to settle for Gruyere. Still, what's not to like about cheese, bacon, onion, potatoes and cream?! The Boston Globe had an article on Tartiflette last week. They said that Wholefoods is now importing a reblochon that has been aged enough to meet the requirements of raw milk cheese (I think it is 60 days) where as a I think a reblochon sold in france is aged about 20 days. Tartiflette is also excellent made with Endives roughly chopped and quickly boiled for about 3 minutes instead of the potatoes. It is a scrumdillyumphious, and you don't have to excercise for a day to be able to enjoy it!!! This is a very good basic recipe. I substituted gruyere for the reblochon because I couldn't find it anywhere, including Whole Foods. I had this for the first time in Lyon, France during the X-mas season. It was being made at one of the outdoor fairs and was unforgettably delicious. Thanks for this recipe, Lucy. I've now made this dish three times, with slightly different ingredients, and each time it has been spectacular every time. I've had to use various washed-rind substitutes for Reblochon (the high-end cheese shop in Oakland blames the USDA for their inability to get the real thing), but they have all been delicious. Better, in fact, than in the restaurants outside Annecy and in the Beaufortain where I first encountered tartiflette. Just got back from a trip to Paris over Spring Break last week where I had my very first tartiflette. Heaven! Was very excited to see your recipe. I know that Reblochon is the traditional cheese used for this, but it isn't available here. I wound up using a cheese called Delice de Bourgogne but followed your recipe otherwise (well, except for the duck fat). The house smelled so good, and better yet, this dish was awesome. My daughter even said she thougt it was better than the one that we had in Paris. Thank you for posting!